I’ve always liked May. It’s almost like summer, but cooler. It starts with a holiday. It brings us strawberries. And pollen. Plenty of pollen. If you’re allergic, you wish you could jump directly to autumn! Hay fever is the worst. I don’t have it, but the bf does and he sneezes and spits no stop for a month. Poor thing. What The Heck Is Hayfever And Why Do I Get it? Hay fever is triggered by exposure to pollen. It makes your nose runny and sneezy and your eyes watery and itchy. Rainy days are your BFF: less pollen in the air. Windy days, early mornings and evenings are the worst. It’s a summer-long affair: tree pollen gets you in early to late spring; grass pollen from late spring to early summer; weed pollen from early summer to early autumn. City dwellers have it worst: pollen + pollution = higher chance of getting hay fever. How Do You Deal With Hay Fever? Close the windows: I know it’s hot but do you really want pollen in your house? Thought so. Dress smartly: no, I don’t mean a cocktail dress. Put on glasses and a wide-brimmed hat. They help keep the pollen away from your face. Have a shower: pollen can stick to skin and hair, so wash it off as soon as you get home. While you’re at it, change your clothes, too. Keep track of pollen levels: the Met Office has daily updates of pollen count across the UK. Speak to your pharmacist or GP about medication: Benadryl Allergy Relief, for example, contains acrivastine, which can reduce the symptoms in about 15 minutes. Or so I’m told. The bf hasn’t tried it, yet. Why Are We Talking About Hay Fever, Anyway? Because hay fever doesn’t just make your life a living hell. It plays havoc on your face, too. And that impacts your self-esteem. How can you look and feel your best with a red nose, itchy eyes and flaky, puffy skin? Prep skin: before doing any work on your face, slather on a hydrating moisturizer. Jo recommends Neutrogena Hydro Boost Water Gel. It’s a simple as it comes. A blend of silicones and hyaluronic acid to replenish moisture and lock it in. That’s it. Basic, but that’s what irritated and damaged skin needs. Go green: no kidding. Green is on the opposite side of red on the colour wheel. That means it can neutralise the redness. Then, you put foundation on so you don’t like Hulk. By the way, Jo used Max Factor CC Colour Corrector. It goes on patchy but does the trick. Use light shades: dark shades make your eyes look smaller while vanilla and beiges have the opposite effect. Jo uses powder eyeshadows, but I think that creams are better for irritated eyes. You don’t want any powder to fall into your eyes! Whiten and brighten: using a white kohl pencil, like Rimmel Soft Kohl in Pure White, on your lower waterline makes your eyes look bigger and more awake. (Gio’s thoughts: But, be careful! Your eyes are super sensitive now and putting everything on your waterline can irritate them even more!). Go waterproof: watery eyes = streaky mascara. The best way to avoid looking like a racoon is to use a waterproof formula. If you’re worried removal will be a pain, use an oil-based cleanser. Something as simple as mineral oil (no, it’s NOT dangerous!) or evening primrose oil will do. Or do what I would do: put on sunglasses and call it a day. Contour your face: not the easiest technique to master, but when done right, it can make you look so much slimmer. Apply bronzer in a 3-shape, starting from your temples into your cheekbones and outwards and downwards towards your chin. Then, gently sweep on highlighter on the top of your cheekbones, the bridge of your nose and on your cupid’s bow for an even more sculpted look. 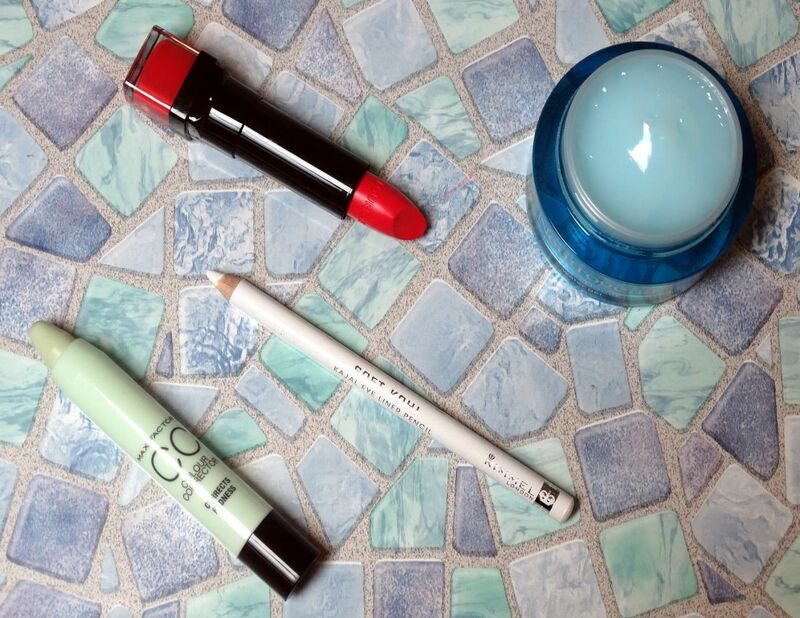 Make a statement: a bold lip never fails to attract attention and dwarf everything else. Plus, it’s perfect for this time of the year. The bolder the colour, the better. I like Bourjois Rouge Edition in Fraise Remix, a stunning coral with pink undertones. But, be prepared to reapply it. Even the boldest red will fade pretty fast with all that sneezing and spitting. Who said that makeup was off-limit during hayfever season? Do you suffer from hayfever? If so, how do you deal with these beauty challenges?